Jefferson Street near East Broadway, New York, NY 10002. Participating Artists & Writers: Ita Aber, Ellen Alt, Dara Alter, Marcia Annenberg, Shoshannah Brombacher, Lenore Cohen, Betty Copeland, Nancy Current, Elisa Decker, Aliza Donath, Miriam Leah Droz, Shelley English, Harriet Finck, Tanya Fredman, Jennifer Gersch, Sandra Indig, Batya F. Kuncman, Eleni Z. Litt, Barbara Lubliner, Irit E. Malinsky, Elsa Mandelbaum, Rifka Milder, Aaron Morgan, Ellen D. Newman, Ksenija Pecaric, Trix Rosen, Debbie Schore, Elizabeth Sowell-Zak, Julie Sugar, Julian Voloj, Ahron D. Weiner. “Embodied Light: 9-11 in 2011″, an installation by Tobi Kahn. Address: Ernest Rubenstein Gallery, 197 East Broadway between Jefferson and Clinton Streets, New York NY. A commemorative exhibit of September 11, 2011. The gallery will be transformed into a meditative room for visitors to reflect on remembrance, loss and the human spirit. Sculptural shrines, memorial candle holders and a floor relief will reference both the specific tragedy of 9/11/01 and a universal reflection on loss, remembrance and hope. Kahn is creating a sacred space consisting of seven shrines, each encompassing an abstract figure, bracketed in solitude by an architectural structure; seven sculpted memorial lights, and two charity boxes made of the plaques like those engraved in chapels with the names of the dead—but blank in ceaseless grief. In the center of the gallery will be a floor relief comprised of thousands of wood remnants from art Kahn made in the decade since 9-11. From above, their overlapping shapes and the patterns they form of refracted light suggest an aerial view of the city’s density, loss, and sustenance. 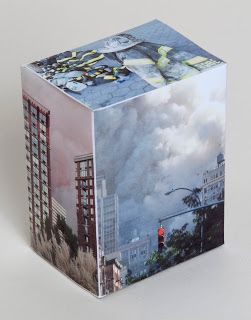 Memory blocks, for the 220 floors in the two towers, were given by hand, ceremonially, to New Yorkers chosen by the artist in spring 2011, and then returned to him with a drawing or inscription that evokes their memory of the day. In changing patterns, obscuring and bringing to light distinct memories, the blocks will be continually rearranged over the length of the exhibition. The accompanying catalogue will have essays by Maya Benton, Curator at International Center of Photography, Norman Kleeblatt, chief curator at The Jewish Museum and by James E. Young, author of At Memory’s Edge: After-images of the Holocaust in Contemporary Art and Architecture, and The Texture of Memory. LMCC appointed him as a juror for the World Trade Center Site Memorial competition. “Kahn has created art for hospices, hospitals and memorial chapels, ranging from a single canvas to an entire room for meditation. The Health Care Chaplaincy has selected Kahn as the principal artist for a 120-unit palliative care residence to be built in Lower Manhattan.” The New York Times 1/4/11. A Facebook page, “Embodied Light,” will be set up to make it possible for new contributors to create virtual blocks, extending the project online.